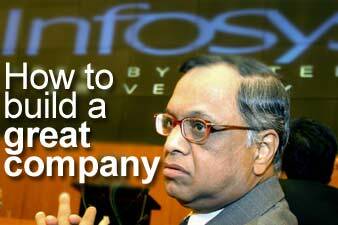 N R Narayana Murthy, Chairman of the Board and Chief Mentor, Infosys Technologies, outlines the key ingredients to building a great company and the role of 'compassionate capitalism' in society. You are fond of using the term 'compassionate capitalism.' What does this mean in the context of India? As I look back on the idealism of my youth, I realise that a socialist system will not succeed as a system, because people need opportunities, incentives and competition in order to better themselves. This is the essence of capitalism. Embellish the spirit of capitalism with fairness, decency, transparency and honesty, and the result is compassionate capitalism. Compassionate capitalism is extremely important for every society, in general, and for developing countries, in particular. In India, where the divide between the haves and have-nots is very large, the only way we can reduce this divide is by embracing compassionate capitalism. To what do you attribute the success of Asia's multinationals? The first factor is the work ethic. By and large, there is tremendous focus on hard work, pride in the company, and loyalty to the company in Asia. This focus exists in the West too, and that's how they have built great companies. However, I see less emphasis in the West on such a work ethic these days. Second, there is a spirit of family in Asian companies. This means working as a team, showing concern for your fellow employees, making sacrifices for each other's benefit, and identifying with the common cause of the company. How has Infosys responded to the tsunami that struck South-East Asia? Infosys has contributed Rs 50 million to the Prime Minister's Fund. In addition, we requested employees to contribute a day's salary on a voluntary basis. We did something similar after 9/11. We were the first Indian company and one of the few in the world outside the United States to contribute to the Firemen's Fund. The Infosys Foundation has donated clothing, medicine and food items to the victims of the tsunami. Some of our people have gone to affected areas and helped people to improve processes for better management of aid distribution. Some companies sell to the bottom of the economic pyramid, to customers with relatively little spending power. What is the business case for multinational companies to target this market? About 80 per cent of the global population lives in the developing world. These people have low disposable income. Thus, taken as individuals, their buying strength is small but, as a group, they have an enormous potential as a market. On the other hand, the markets in the developed world are getting saturated and growth is coming down. Hence, if multinational companies were to design products that are inexpensive and cater to this vast segment of low-disposable income consumers, then there is tremendous growth opportunity both in revenues and profits for MNCs. Business can address social challenges through public-private partnerships. Again, what is the incentive for companies to partner with the public sector? Public-private partnerships in developing countries like India are very important because a company cannot prosper on a sustainable basis, unless it makes a difference to the context in which it operates. By making a difference to the society in which they operate, companies create goodwill in the society, and become friends of the society. This responsibility is even greater in the case of multinationals, since there is a mistaken belief that multinationals do not care for the context, and are there only to plunder the society where they operate. When the vast majority of the poor believe that there is a positive impact on them because of a public-private partnership involving multinationals, it is likely to create tremendous goodwill towards these companies. What is the key to building a great company? First of all, we need good leadership. I don't know of a single great company that has not had good leaders. Great leaders raise the aspirations of their followers; they make people more confident, energetic and enthusiastic. Such leaders make people embrace the adage: a plausible impossibility is better than a convincing possibility. People, who are motivated by great leaders, dream big, make sacrifices and achieve miracles. It is not sufficient just to have great leaders. We need a mechanism to identify, train, empower and mentor successive generations of leaders. Such leadership training and mentoring has to become the responsibility of the current generation of leaders. Second, we have to create a grand, noble vision which elevates the energy, enthusiasm and self-esteem of everyone in the company while ensuring that everybody sees a benefit in following the vision. Third, a company has to benchmark itself on a global scale in every area including sales, production, human resources, R&D and finance. It creates an open and confident environment where first-raters recruit first-raters. Fourth, a great company continuously measures and improves the following attributes: meritocracy, fairness, justice, openness, speed, imagination and excellence in execution. Finally, a great company practices an enduring value system, and follows the finest system of corporate governance. Reproduced with permission from the World Economic Forum. Rediff.com is the WEF's online media partner. Its really great of Mr.narayan Murthy .He is contributing a lot in the growth of our nation !